Purebread Bakery in Gastown is fast becoming my favourite go to spot for deliciously fresh and reliably good baked goods. 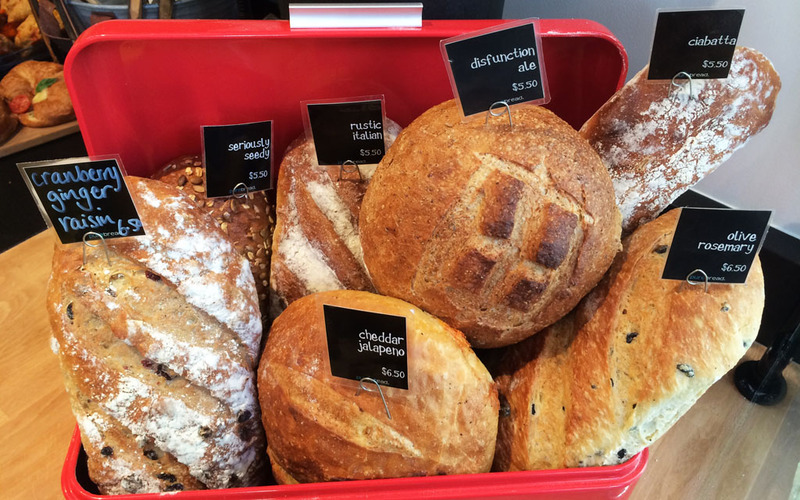 Located on West Hastings (near the corner of Cambie Street), Purebread bakes a tempting range of loaves, breads, and pies fresh everyday, as well as a number of sweet and savoury treats. 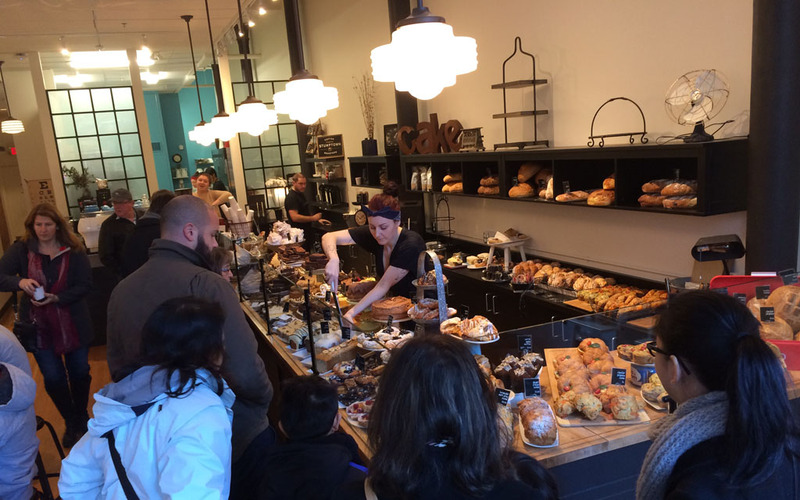 While the baked goods selection changes daily, patrons visiting Purebread are guaranteed a counter top stacked high with cakes, brownies, croissants, cookies, scones, and brioches. With such outstanding variety the task of choosing something can be a little overwhelming, so much so that the thought of buying one of everything seems like a pretty good (albeit a rather extravagant) idea. If buying one of everything is not an option, take comfort in knowing that everything is as delectable as it looks. 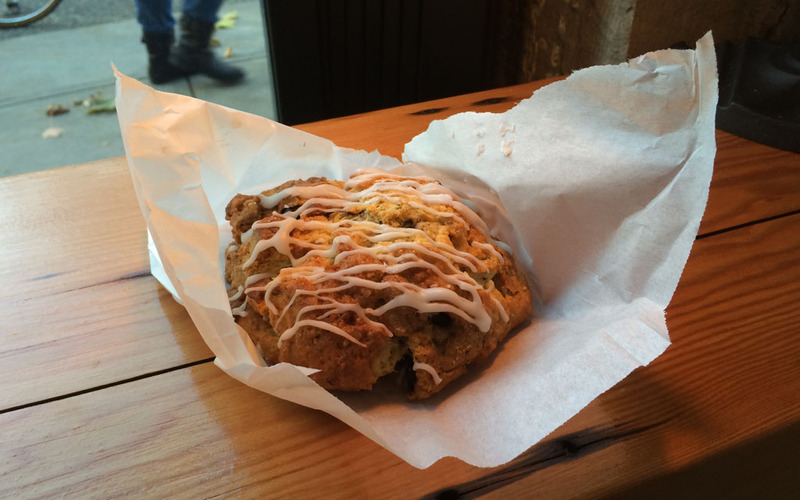 I always find it impossible to resist one of the bakery’s signature scones. First of all they’re huge and secondly, they come in a range of temping combinations like apricot-vanilla bean, lavender-earl grey, ginger-cream, and buckwheat sour cherry. Having eaten my way through most of the flavours, I can say with all honestly that my absolute favourite is the lemon-blueberry-basil ($3.50). A delightfully sweet and perfectly crumbly scone, that is sure to satisfy anyone with a sweet tooth. While the assortment of treats at Purebread Bakery is considerable the seating on the other hand is somewhat limited. With only a handful of tables and chairs, this is the type of place that you either take away or sit, eat and go, not sit for hours on end. Having said that though, if you’re lucky enough to grab yourself a stool at the window you will have found a positively cosy nook to enjoy a pastry and coffee (made with Stumptown Coffee Beans), where it is easy to while away an hour watching the world and the colourful characters of Gastown go by. 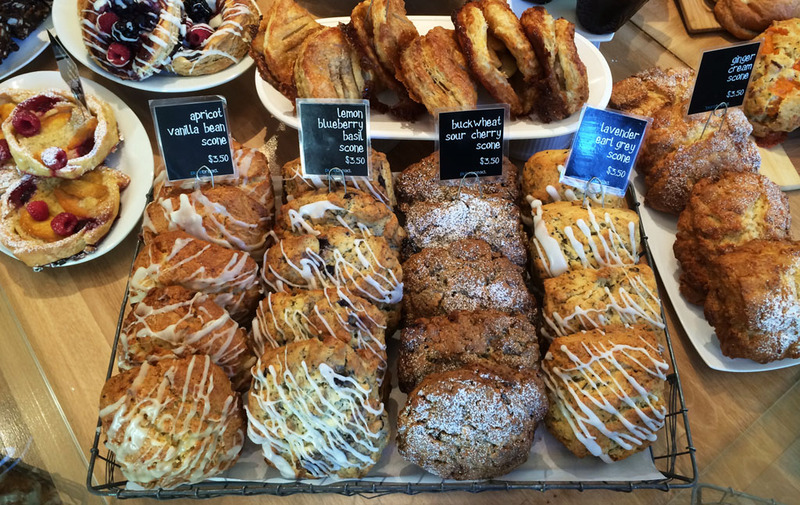 Originally hailing from Whistler, Purebread makes all of its delicious offerings from scratch and on-site daily. Therefore, it is not uncommon to see the pastry chefs in the adjoining kitchen hard at work, baking up a storm throughout the day. 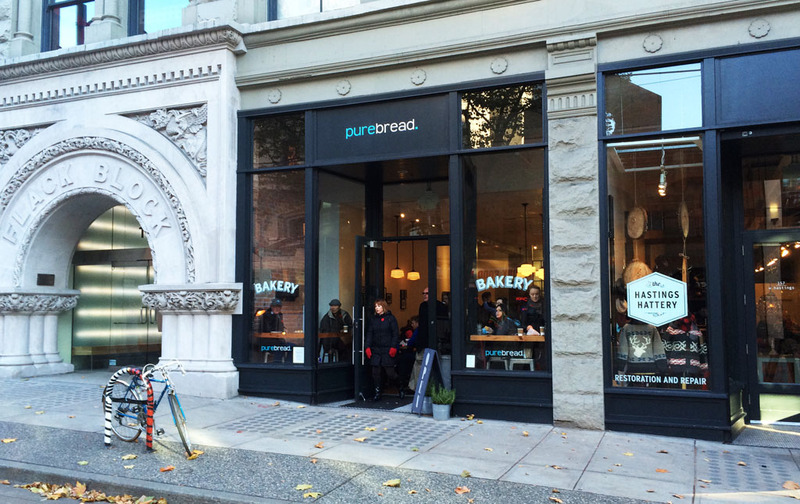 Since opening in October, Purebread has become quite the sensation with all who walk through the door. It’s often very busy, not surprising really, given the friendly, smiley service and more importantly the delicious and plentiful array of baked goods.